Digital ideas with a physical twist. © 2019 garethjam.es. All rights reserved. “Do and Make” is a big thing here at Brilliant Noise, something that’s really close to my heart too. The process of thinking by making is immensely valuable: “doing-out-loud” rather than “thinking out loud”. When we “do-out-loud” we pull people towards our thoughts and ideas, the more people that are attracted towards the things we are doing, the more discourse, collaboration and building on ideas occurs. Ideas get stronger, hypothesis get proven, things get made and fun is had. Here’s how it worked recently – Sam, our in-house developer, had been hacking away at a Raspberry Pi to visualise the ‘status’ of one of our meeting rooms. He was querying our Google Calendar and displaying if a room was busy and who it was booked by on an old mac monitor. This simple act of ‘doing-out-loud’ got us talking and these thoughts led to the idea of making a little Internet of Things creation that could display the status of a room and allow you to quickly book it there and then if it was free, avoiding phone fumbling. 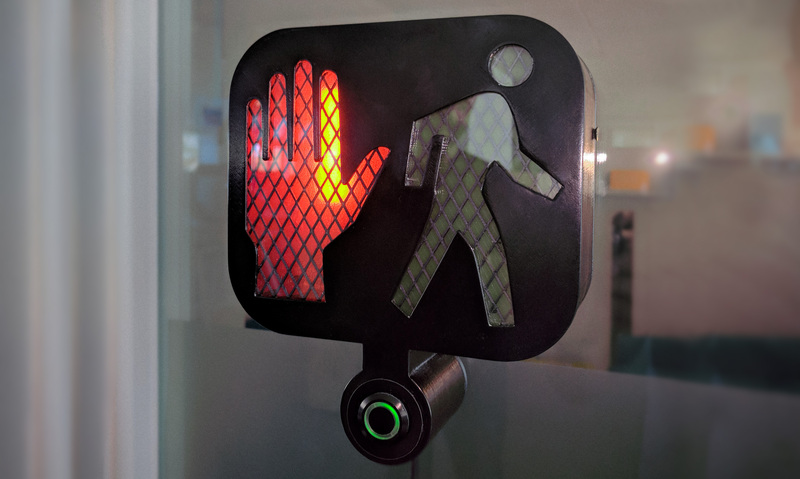 Inspired by a crosswalk sign in the shop down the road, I set the 3D printer in motion, sourced some LEDs and relays to switch them on or off. I used a nodeMCU device, as I had never used one before and wanted to give it a go, it’s nice and cheap ($5) and easy to program through the Arduino IDE. Pretty soon the room status thing was taking shape. The back end was developed in consultation with Sam and it allows the room to be checked every 20 seconds. When it’s free the green man lights up, when the room’s busy (you guessed it) the red hand lights. Technically; Node.js handles the backend, and a cheeky bit of IFTTT gets the room booking done. This was a quick-as-possible hack so using google OAUTH was just too big to get involved with that was swerved. If this prototype is a success (we’re logging usage of this thing) we can print and wire-up more for the other rooms and evolve the design and feature set further. Moral of the make? Do-out-loud, you’ll inspire and build better products.